Bryant Park's staff is comprised of a diverse team of experts - architects, gardeners, event planners, security officers, retail experts... the list goes on. However our mission as a business improvement district and vibrant urban space is largely driven by our President, Dan Biederman. 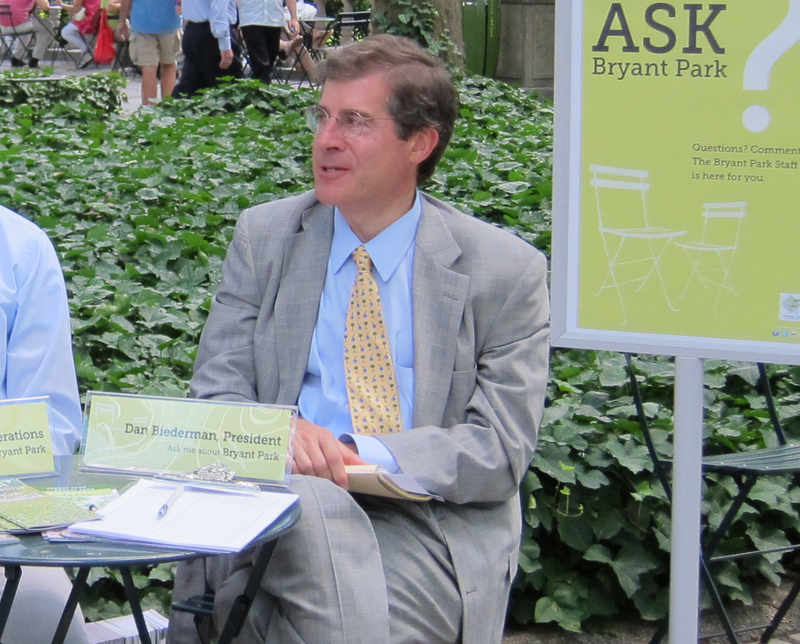 Patricia R. Olsen of the The New York Times sat down with Mr. Biederman for a look at his background and how it has inspired his approach to the management of public spaces. WHEN I was 9, a trip to the White Mountains in New Hampshire during summer camp started my interest in parks and hiking. After that, I visited national parks and decided I liked rugged rural areas. Later, I grew to appreciate bits of nature that governments provide for urban residents. I graduated from Princeton in 1975 with a bachelor’s degree from the Woodrow Wilson School of Public and International Affairs. I liked the idea of working in cities because they’re intellectually stimulating, but the ideal job for me was probably as a forest ranger. Redeveloping city parks, which now accounts for half of my work, is a compromise. I also create business improvement districts, in which businesses pay extra taxes or fees to improve their areas. I co-founded and serve as president of three management organizations for redeveloping sections of New York City: the 34th Street Partnership, the Bryant Park Corporation and the Chelsea Improvement Company. I started Biederman Redevelopment Ventures in 1998 because I was getting so many requests for free advice. Through the company, I’ve consulted on projects in places including Los Angeles, Chicago, Dallas, Miami, Finland, Britain, Canada and Israel. Three experiences helped prepare me for this career. The knowledge I gained from my M.B.A. program was key; I graduated from Harvard Business School in 1977. My father, a textile executive, was also instrumental in my training. He had a good management eye; he knew how businesses should operate. When we went to a movie or to a restaurant, he’d point out things to me. I don’t know if he was even aware of what he was doing. Finally, I’ve been influenced by some of the sites I’ve seen, like Rockefeller Center in New York, Faneuil Hall in Boston, the Royal Parks of London, and Luxembourg Gardens in Paris. If you’re observant, visits to such places build your skills as a public space designer. I start with a vision and then raise money from private sources. I don’t seek public funds because there are strings attached to how the money can be spent. Also, I work mostly in commercial districts. I’d rather not compete for funds in neighborhoods that have few options for improvement other than government. I approach each project differently. Often, business owners who want to improve their neighborhood ask me what I would do. I tell them my ideas, which may start with removing litter and graffiti and adding beautiful lampposts and attractive benches and plants. Then I figure out how to find the money to pay for the capital and operating improvements. One of my college internships, with a city agency, has had a lifelong impact on my use of interns. The agency didn’t really know what to do with me; it put me in a back room and gave me a report to write. I was falling asleep at my desk. After a few weeks, I asked to become more involved in the work of the office. As a result of that, I decided to always be attentive to interns and junior staff members. The second that interns start with us, we drop them in the middle of an exciting project and include them in meetings. Recently, the 34th Street Partnership issued bonds for capital improvements. I took three junior staff members along to the investment bank pricing the bonds because I thought they’d find it interesting. Bryant Park is special to me. I tell people that it’s my life’s work, but some of them correct me and say no, that it’s the first park I redeveloped. We’re not done there, however. We’ve got to keep perfecting it.